A new EU policy to fight organised crime till 2020 is to be launched during Malta’s EU presidency. 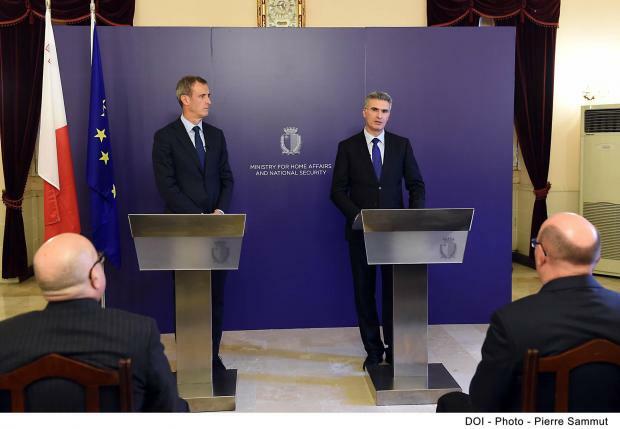 He was addressing a press conference with Europol Director Rob Wainwright at the Police Headquarters in Floriana, following a meeting between the two sides where views were exchanged on dossiers related to security, as part of the final preparations for Malta's upcoming Presidency of the Council of the EU. Mr Abela noted that the new EU Policy Cycle will continue building on the present EU policy cycle launched six years ago aimed at enhancing the fight against serious international crime and organised crime, while strengthening effective cooperation and robust operational action, targeting the most pressing criminal threats. The policy cycle was based on a set of priorities, and Malta participates in five of these operations, including on illegal immigration, drugs, card fraud, and child sexual exploitation as part of the fight against cybercrime. The minister said that police cooperation between member states to combat organised crime will remain a priority. He said that in a time where crime has become borderless, efforts must also be trans-national, and coordination has to go across borders. “In these challenging and complex times, we need to keep on working on a strategy for safety for the benefit of all European citizens,” he said. Mr Wainwright said Europol is working hard to connect communities across Europe in the daily exchange of thousands of intelligence messages about the ongoing activities of the most dangerous criminal terrorist organisations in Europe. The Malta police force has a Europol National Unit, serving as the point for exchange of information between Europol and other national units and law enforcement bodies in Malta. It gathers, analyses and disseminates information.